Creative Diagnostics provides a full range of service in custom anti-idiotype antibodies (anti-IDs) to support your new monoclonal antibody drugs development. At Creative Diagnostics, our scientists utilize the proprietary technology to guarantee the high specificity and affinity of anti-idiotypic antibody, including magic adjuvant and immune mediators, super-sensitive hybridoma screening, and optimal clone selection processes. We have accomplished 95% success rate of anti-IDs antibody development for our customers. 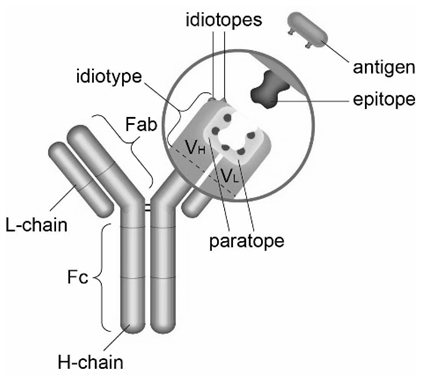 The idiotype represents the complementarity determining regions (CDR) of an antibody, including the unique antigen binding site, and the combination of epitopes within the idiotype is unique for each antibody. When one antibody binds to one idiotope of another antibody it is referred to as an anti-idiotypic antibody (anti-ID). These highly specialized anti-idiotypic antibodies have become a powerful tool for antibody drug pharmacokinetics (PK), pharmacodynamics (PD) and immunogenicity studies. Anti-idiotypic antibodies that recognize an antigen-combining site of an antibody can mimic the structure and/or function of certain nominal antigens. This feature makes them especially useful in unwanted immunogenicity assessment. For system suitability controls, the FDA recommends that a positive control antibody, either mono- or polyclonal, used at development and validation of immune assays for assessment of the immunogenicity of therapeutic protein products during clinical trials. A number of various assay formats and platforms are available that can be employed for immunogenicity assessment. Both assay types can be used together for the complete characterization of the antibody response against the antibody drugs.